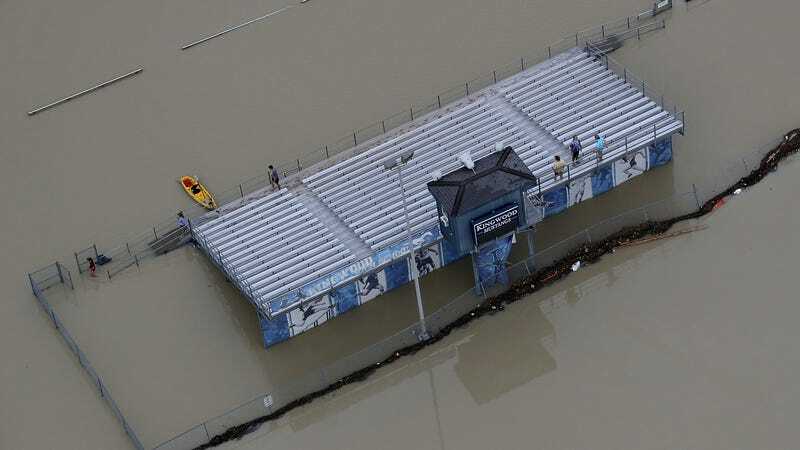 High school football bleachers near Lake Houston. Photo via Getty Images. Behind all the immediate dangers of Hurricane Harvey come a horrifying multitude of disruptions, troubles, and logistical nightmares. For instance, more than a million public school students have been affected by the disaster, and many of them don’t have anywhere to go to school anymore. ABC News reports that, according to the Texas Education Agency, there have been closures in 200 out of 1,200 school districts statewide. “Roughly 20 percent of our student population has been affected by Harvey,” said spokesperson Lauren Callahan. The district serves 3,316 students, according to its website. A later statement from Superintendent Joseph Patek to clarify how long schools will be closed painted a stark picture of the area’s current conditions and road to recovery.